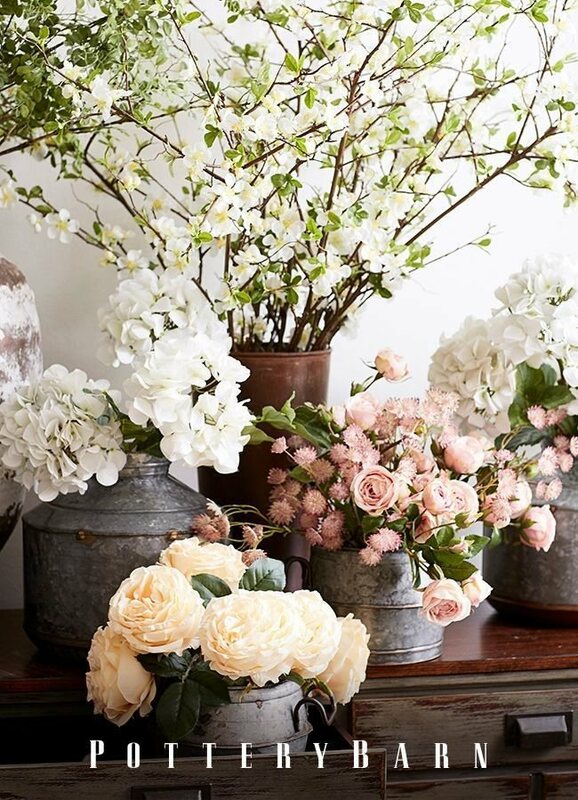 Isn’t it always a pleasure to brighten up your farmhouse with some spring décor? Not only does the décor lighten up your farmhouse, but it could also be a total, wondrous transformation for the outlook. What’s more, is that the process and experiences of decorating are always fun and memorable. Who wouldn’t want these? 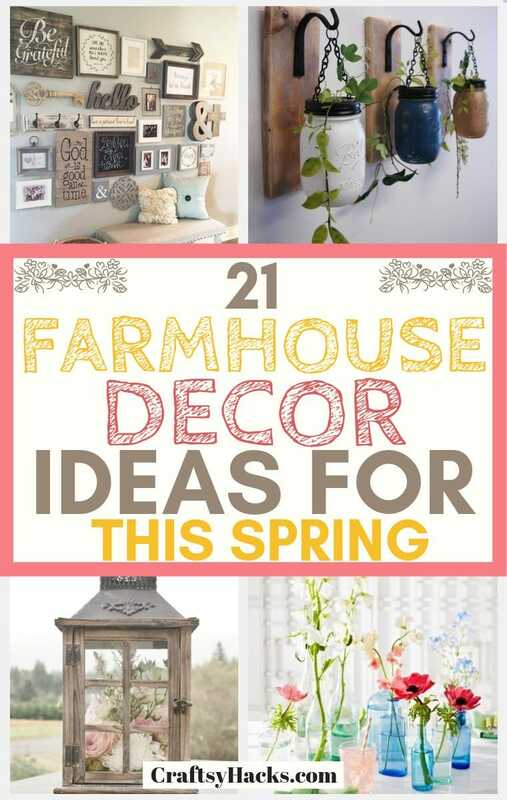 Here are 20 farmhouse décor ideas for you to try out this spring. This is quite simple to make. Get your hands on some Styrofoam or plastic eggs of different sizes –according to your preference. Get some glue and finally, some moss and you’re good to go. Coat the eggs with the glue and then add on the moss. It instantly makes for your farmhouse décor. Get a wooden bowl to make this décor idea happen. 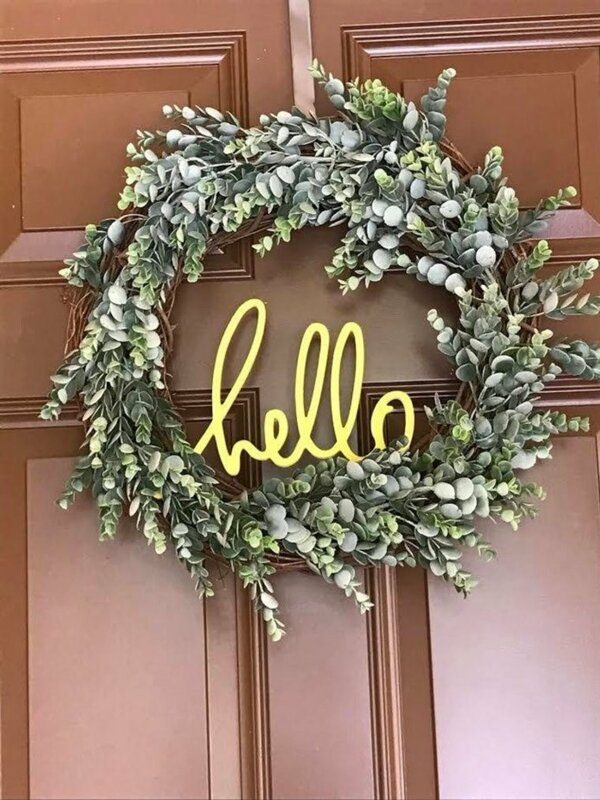 Hanging a wreath on your entrance door can make for a simple yet lovely spring décor. You can make a wreath in less than ten minutes and choose whatever color of flowers suit your taste. 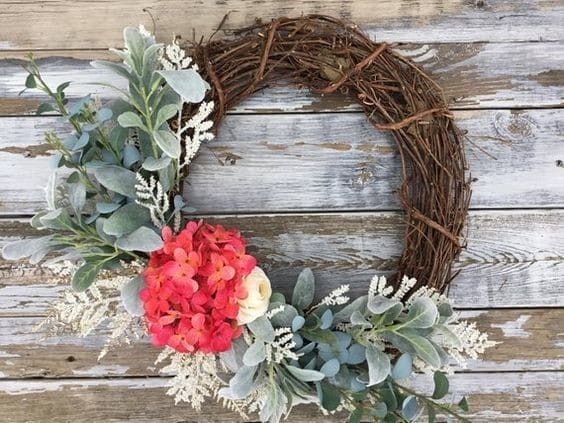 Wreaths are amazing for decorating the porch in the spring. So, definitely make one! 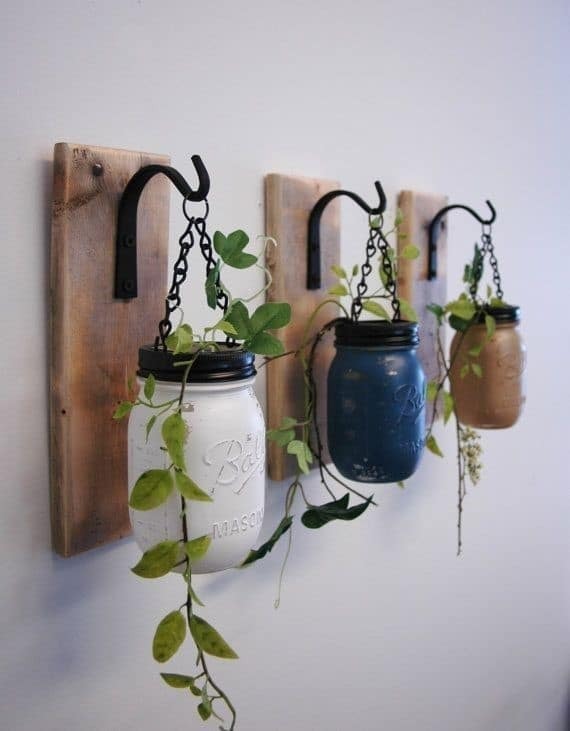 Another beautiful farmhouse décor is to use up your mason jars. Plant in herbs and spices and use for decorating the kitchen or porch, you can also scatter them around the house. So, get these mason jars and start decorating. This is quite easy. 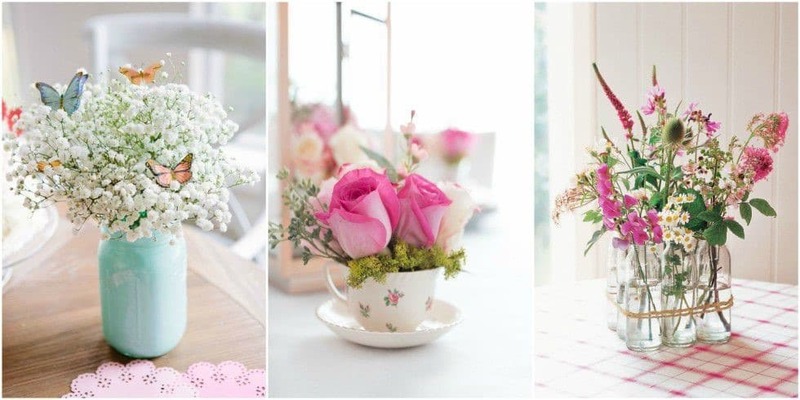 You simply put one large budded flower in a teacup. The cups could be clustered on your table or scattered around your house. Also, you could get a shabby vase like this one here or a vintage-styled vase. 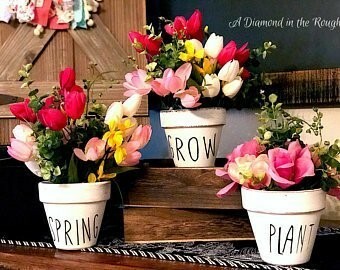 Arrange three or more pots with blooming flowers. 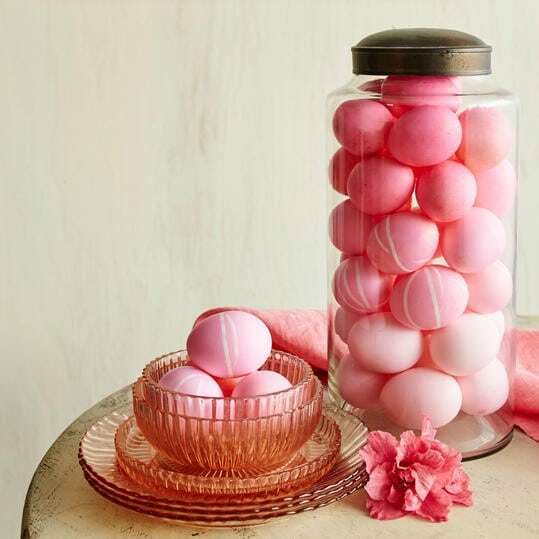 This is a perfect “welcome to spring” décor idea. What to do here is simple. 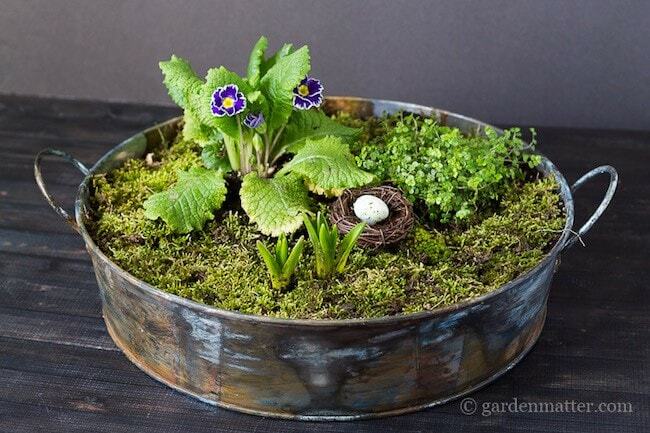 You get a basket and lay some empty bottles or plastic at the base before covering up with sheet moss and flowers. This should give your farmhouse entrance a beautiful spring décor outlook. You can make floral prints that serve as insignias for spring and frame them to hang on your walls. These wall prints can be bought at a cheap price. Also, you can just DIY from old posters and flower photographs. Get a few farmhouse style frames here or a few rustic signs like this one here. 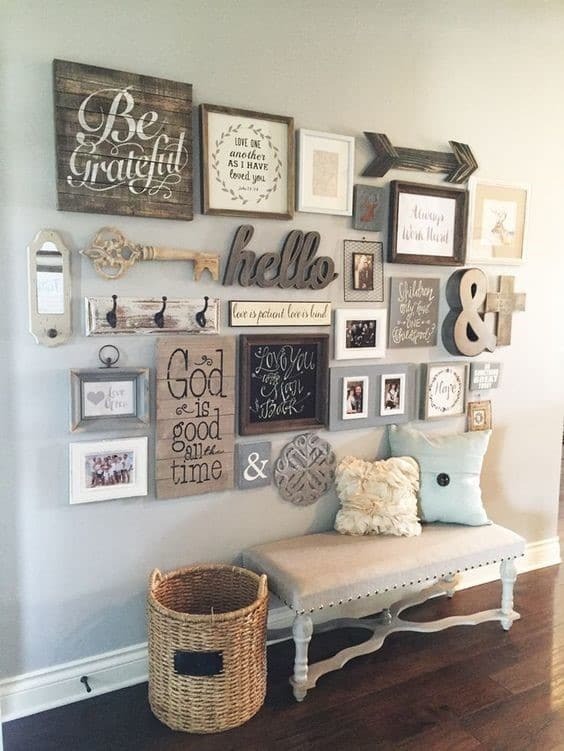 Arrange all of these and you’ll have a beautiful farmhouse wall art. 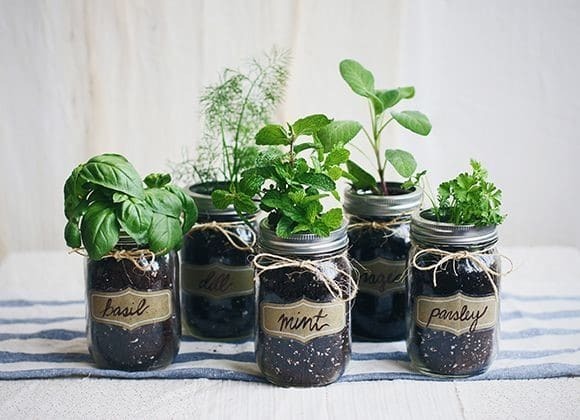 You can also use your leftover mason jars. Put flowers in them and hang on walls around the house. 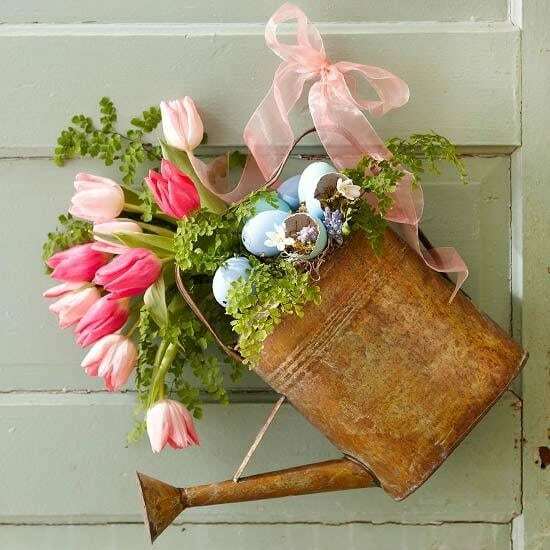 This is perfect if you are looking to achieve a rustic touch in decorating your farmhouse for spring. This is a really nice way to spice up your farmhouse porch for spring. Get a beat up watering can and some flowers. I’m sure you know the rest. Make sure to use bright flowers that will complement the watering cans. Here are a bunch of rustic style watering cans that will do the job. An alternative to watering cans and mason jars – well not necessarily alternative as you can use them all together- is the terracotta pots. You can easily get these from your neighborhood tool store, give them a fresh coat of paint and put in your flowers. You can also get terracotta pots online from here. Might save you some time buying these online. Get an egg box and fill up with some fresh tulips of colors that suit your taste. 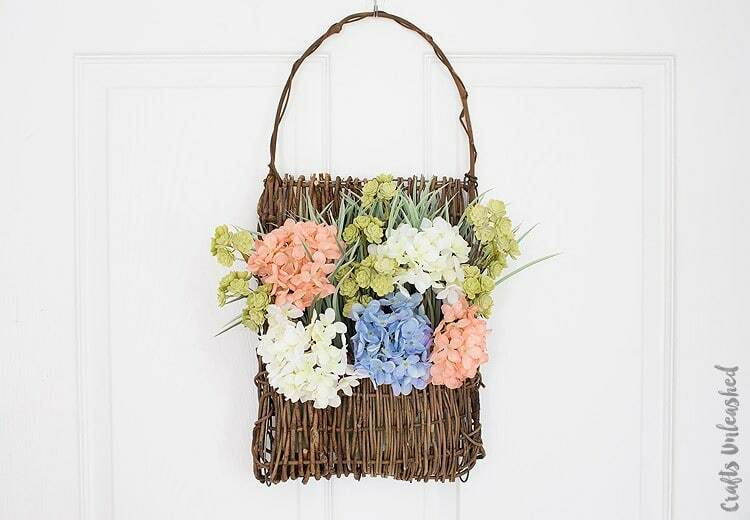 You can easily place this on your porch and make it feel spring ready. Here are a bunch of wooden boxes that will make it all work. 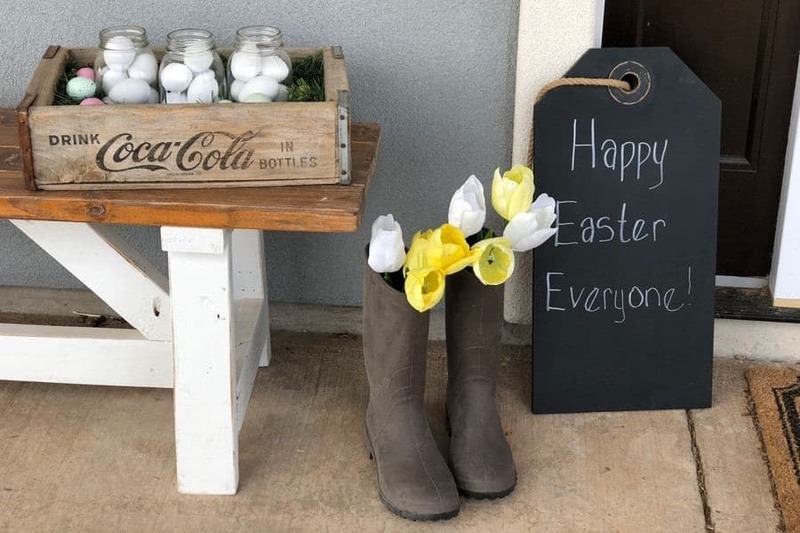 A great idea for farmhouse decoration during spring is simply to place you farm your boots out on the porch. Get an assortment of beautiful long flowers around which you can place in the farm boots. Let then peek out of the boots and you are definitely getting set for your ultimate spring décor. 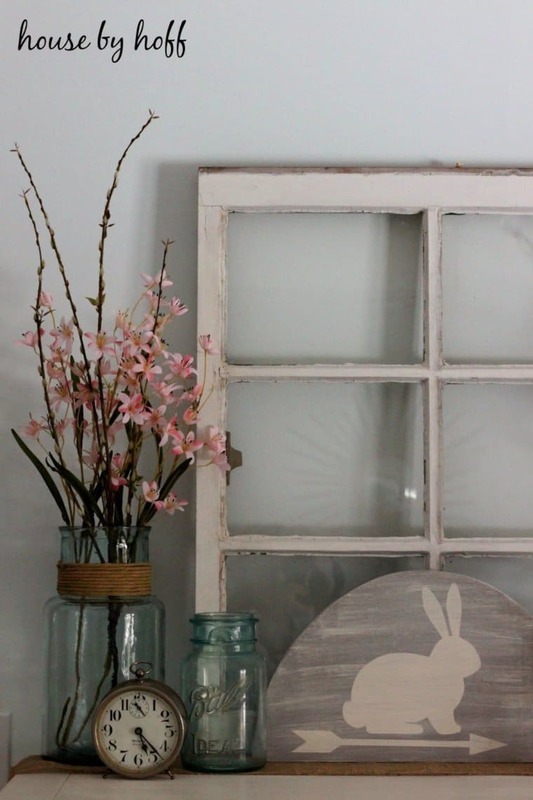 Add style to your farmhouse spring décor by placing simple vignettes on tabletops. You can put some flowers into light colored vases too. Also, add a few of your vintage accessories to go with it, sitting as centerpieces on your shelf or table. Here are a few beautiful rustic style white vases you can choose from. Also, here are some of the cutest farmhouse style accessories. You can turn your lantern into the perfect spring decor item. 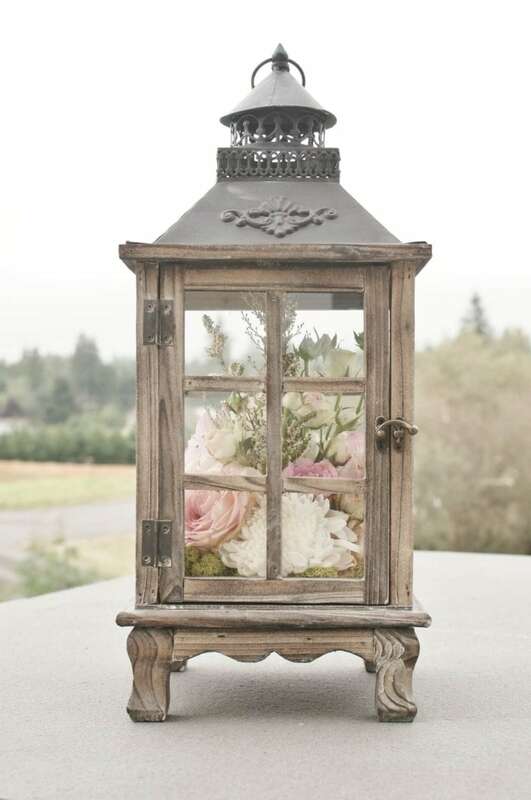 Take your lantern, open it up and neatly arrange some flowers in it. For spring farmhouse decoration, there are no limits to what you can do or design with on a simple chalkboard to get the perfect air of spring feeling right on your porch. You can write your favorite quote about spring or simply draw something. In some cases, a simple “welcome” surrounded by flowers might suffice. Also, you have the option of using white chalk or going all out to use multi-colored chalks. You can get a chalkboard here and a bunch of chalk markers here. 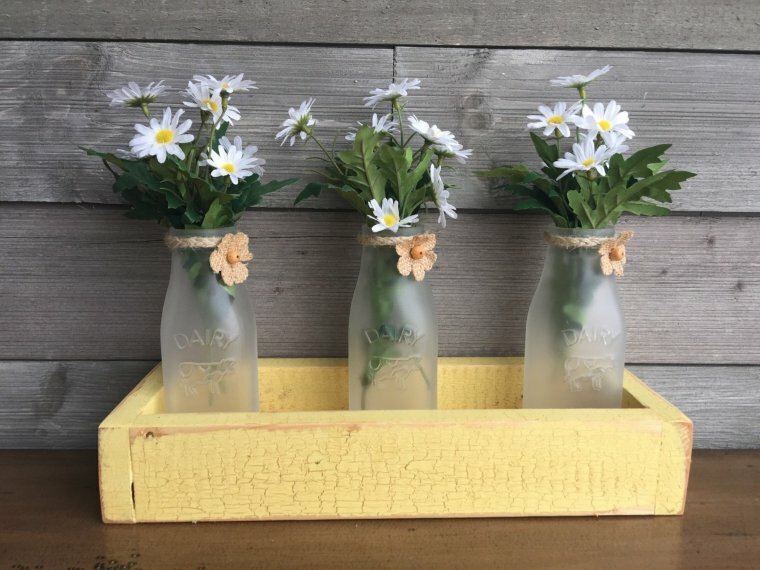 Unused milk bottles can be collected for your farmhouse spring décor. You can paint them and arrange a selection of flowers in them. This might fit perfectly on your dining table or on your porch or kitchen. 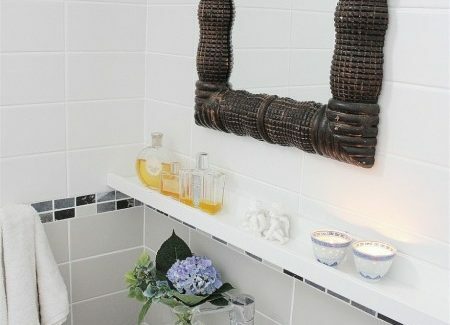 Need more décor ideas on a lower budget? 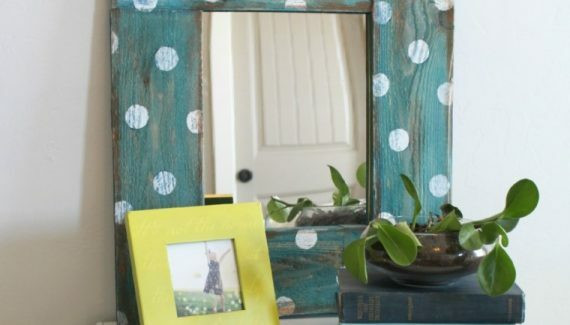 Try these IKEA décor hacks. 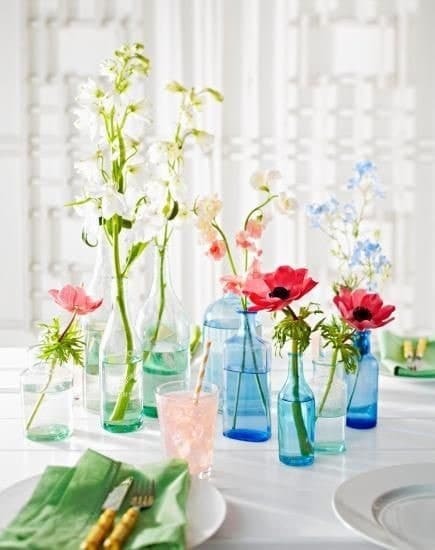 Get some glass bottles and paint them in bright, warm colors that are reminiscent of spring. Think light pink, light blue and light yellow for this. Then, put some flowers in the bottles to get a floral feel. 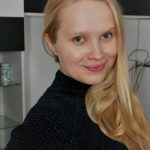 Simple, beautiful and cute! 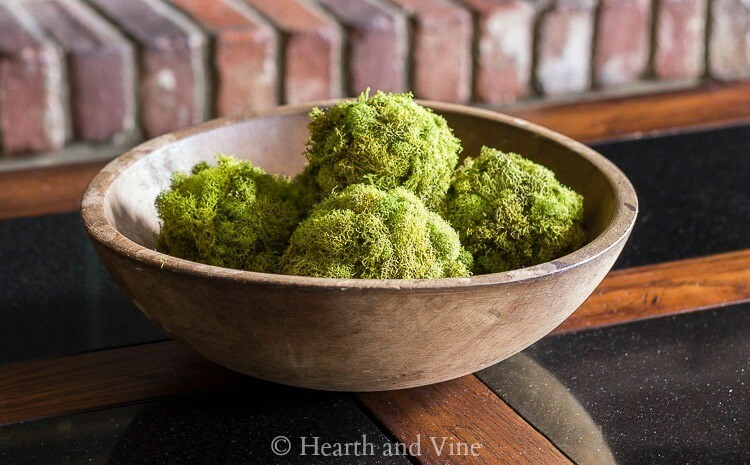 A popular item in farmhouse kitchens, dough bowls can also be used for spring décor acting as the centerpiece. Usually, a large dough bowl is used, placing an array of flowers in them. This makes for a beautiful piece. Using backyard materials you can make something truly special. Find moss gravel, pebbles, and soil. These can make for a beautiful décor piece. It’s the kind of thing that will bring a lot of spring scents into your home. Spring always comes with Easter. And as you know, egg and bunnies are the insignias for Easter. You can make an ombre egg centerpiece. 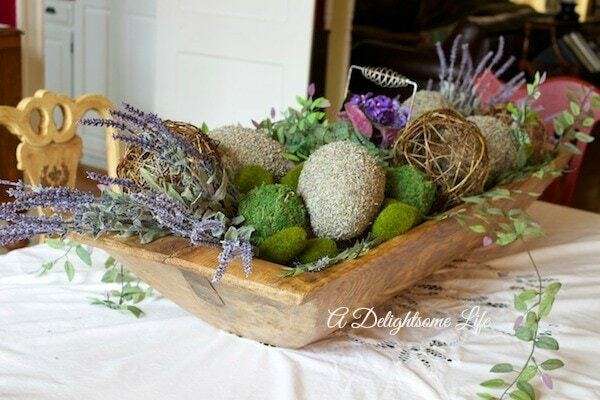 This décor serves a double purpose as you need no redecoration when Easter comes finally. The ombre egg centerpiece is made simply by dying eggs and placing them gently in clear glass vessels. 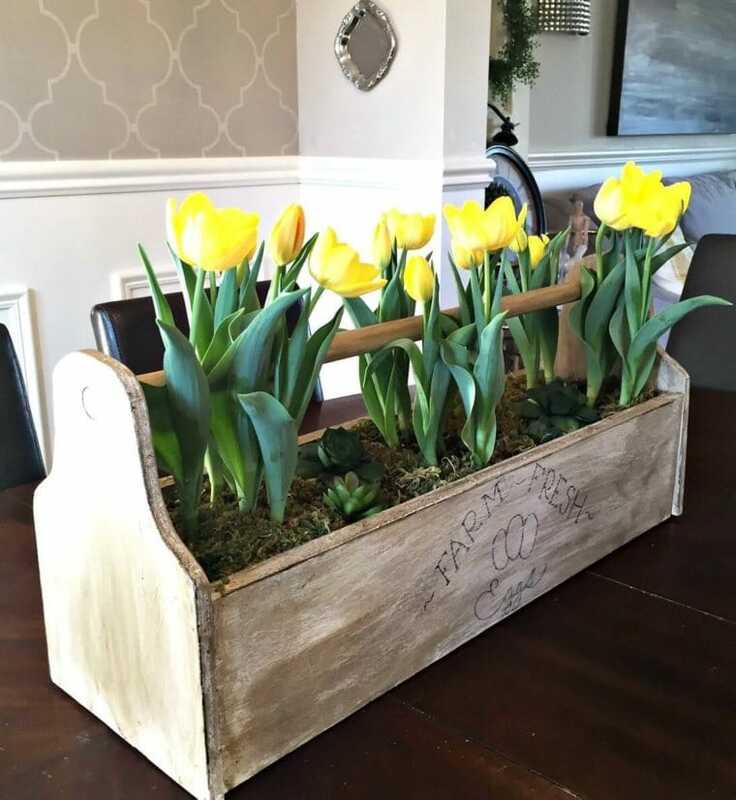 A basket of tulips in your farmhouse can work magic in changing the feel of the house. All of that by making it more colorful, a bit more spring-ey and all nice. 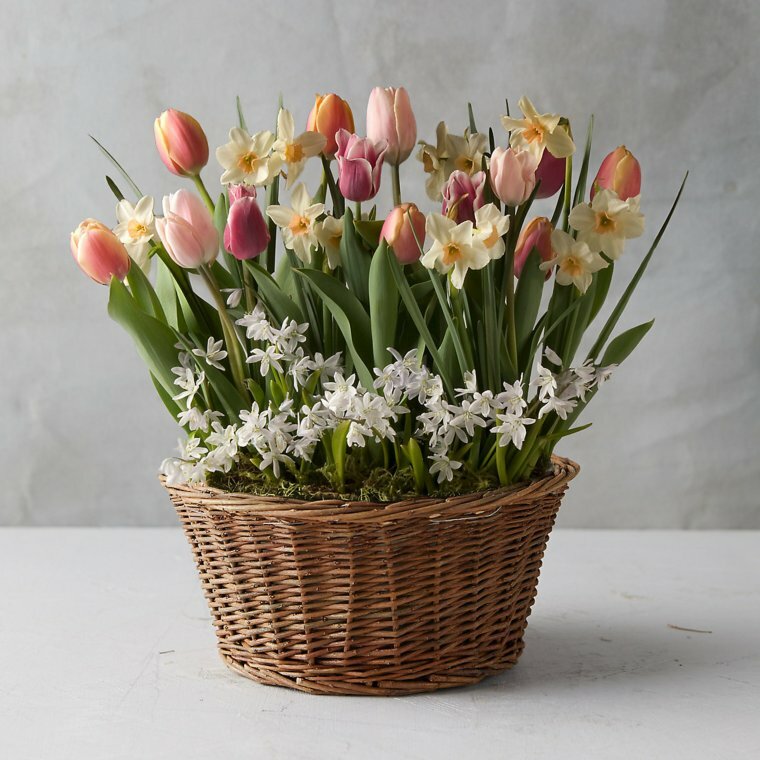 However, the tulips should be neatly arranged in the basket. It is more than just throwing a few flowers in a basket.